Staffing patterns, which are published in conjunction with the occupational projections, provide detailed information on which occupations are employed in each industry sector/sub-sector (and the reverse). Data is available for the State of Iowa and by Iowa Workforce Development (IWD) region. Current data can be viewed and explored in the Tableau visualization below. The default view shows the number and percentage of the detailed (6-digit) occupations most employed within all industries in the State of Iowa. You can narrow this view by first selecting which level of industry you are interested in analyzing with drop-down #2: sector or sub-sector. 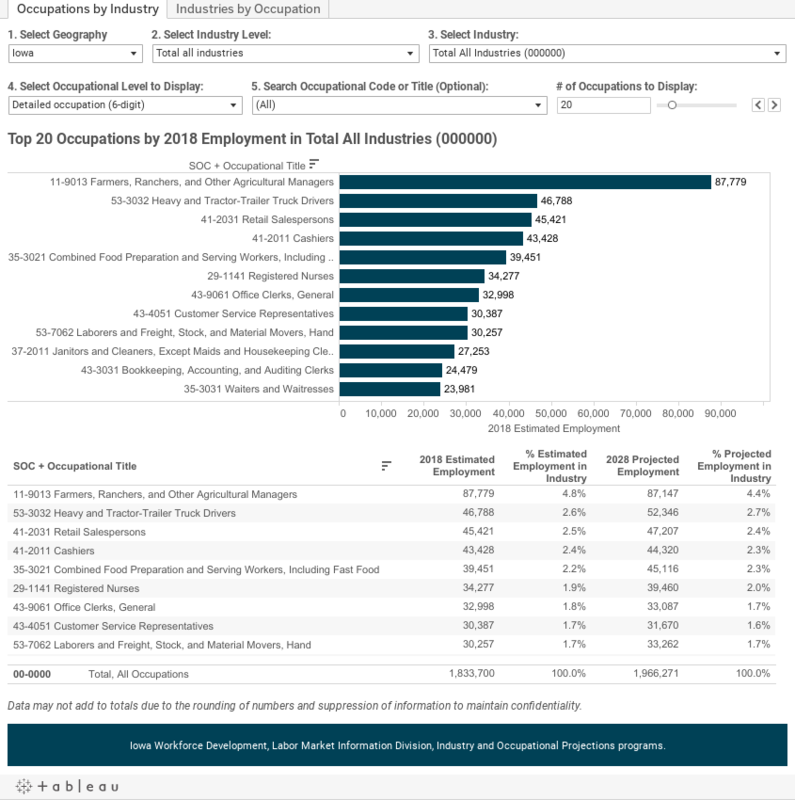 When you select a sector (or sub-sector) from drop-down #3, the chart and table will update to show the occupations most frequently employed within that industry. Use drop-down #4 if you want to group occupations differently and drop-down #5 if you're looking for specific occupations within the industry. The Industries by Occupation tab (accessible at the top of the dashboard) can be used similarly to search for which industries employ a specific occupation. The data is also available in a CSV file. Click the button below to download the file.